To build an exposure map for a single ACIS chip. create an exposure-corrected image, and find an approximation for the source flux. If more than one chip is being used, follow the ACIS Exposure Map (Multiple Chips) and Exposure-corrected Image thread. The srcflux script computes the photon flux as described in this thread for sources automatically. In this example, the script is run for a single ACIS chip. The input event file is provided, and the supporting data filenames are read from the header. Bad pixel file repro/acisf11823_repro_bpix1.fits found. Since we added a DataModel filter, to restrict the analysis to just the ACIS-I1 chip, we had to explicitly list the event file, rather than just giving the directory name (e.g. setting infile=repro/). You can check the parameter file that was used with plist fluximage. Now proceed to the Calculate the Source Flux section, using the exposure-corrected image (here, chip1_broad_flux.img). First, we need to create the image which will ultimately be normalized by the exposure map. In this case, four chips were on for the observation. Using ds9 to display 11823.evt2, we know that the source we are interested in is at sky coordinates (called "physical coordinates" in ds9) close to x = 4181, y = 3942. We can use dmcoords to find out which chip the source is on. This tells us that the chip we want is ACIS-I1, i.e. ccd_id = 1. 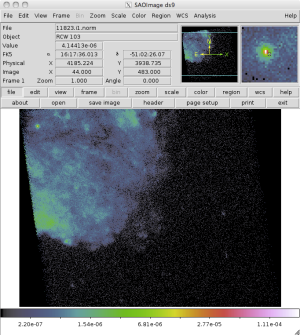 A description of the layout of the ACIS focal plane can be found in the caption of Figure 6.1 in the The Chandra Proposers' Observatory Guide. By spatially filtering the events we include knowledge of the edge of the CHIP in the data subsapce of the image; this can be seen in the output of the dmstat call, where those pixels that lie outside the chip are ignored (i.e. the null row is not zero). It also means that the "bin sky=2" directive applies only to the SKY range covered by the chip rather than the default 8192 by 8192 area (this is seen in the output of get_sky_limits above). See the chip region FAQ for more ways of finding the chip boundaries. unix% asphist @acisf11823_asol1.lis 1.asphist "11823.evt2[ccd_id=1]"
You can check the mkexpmap parameter file that was used with plist mkexpmap. 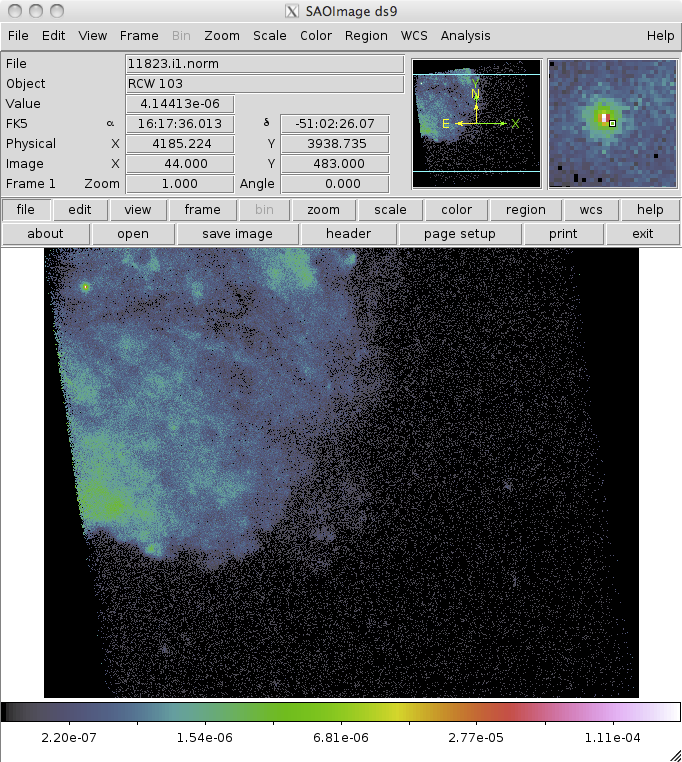 The exposure map may be displayed in ds9 (Figure 2). You can check the parameter file that was used with plist dmimgthresh. The units of 11823.i1.norm (Figure 3) are [photon/cm2/s/pixel]. 15 Oct 2012 The fluximage script has been updated in the 15 Oct 2012 scripts package: changes include an updated parameter file; output file names are different; and support for spectrally-weighted exposure maps. 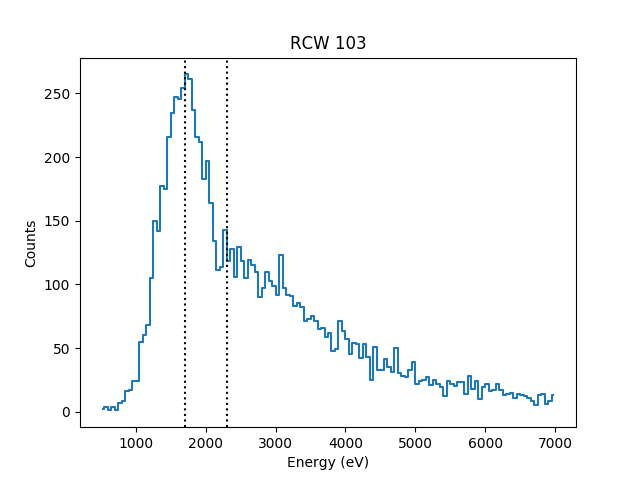 The observation used as an example has been changed to ObsId 11823, an observation of the supernova remnant RCW 103. The step-by-step guide has been updated to better match the fluximage script: e.g. 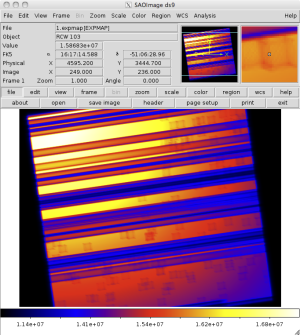 use of a FOV file for filtering the observation; using the same energy value for the exposure map rather than taking the peak of the spectrum; the exposure map is now also thresholded; and the exposure-corrected image is created with pixels containing 0 (Figure 3) or NaN (Figure 4) where there is no data. 04 Dec 2013 Review for CIAO 4.6; the pbkfile parameter for fluximage has been removed and is deprecated for mkinstmap; an event file, rather than aspect histogram, should be used for the obsfile parameter of mkinstmap.